Since our office is in the Isharya spirit today, I figured I would coordinate today’s “Daily Obsession” with our showroom-wide infatuation with all that is Isharya! Before I get into it, did you all see the amazing photos that we took today of Isharya jewels at the Henri Bendel 5th Avenue Street of Shops? We put them on our Facebook page and if you haven’t already – you’ve got to check them out right here! Every woman needs a collection of statement cuffs to play around with. You can never have too many, but you certainly need at least one. I really believe that they amp up any look – always promising to take your style to the next level. With a statement cuff, it is so simple to acheive head-to-toe chic. Who better than Isharya (they practically invented statement jewelry) – to launch your cuff collection? 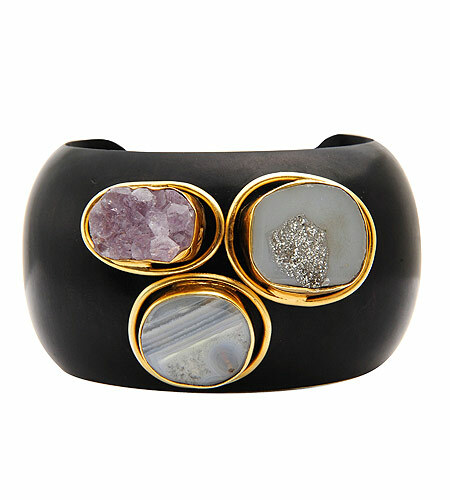 This triple druzy ebony cuff will turn heads just about anywhere. It will take your denim from day to night instantly. It is available now, right here on our webiste. What do you think of this cuff? How would you wear it? Tell me about your collection.